Years ago, I gifted my mom an empty recipe binder, and challenged her to fill it up with our favorite family recipes, only to be returned when I got married one day. 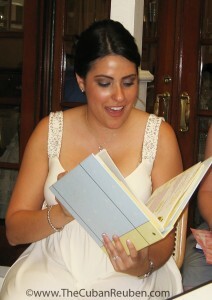 I had all but forgotten about it when at my bridal shower, my friends had front-row seats to the waterworks show that followed me opening the gift from my mother and finding that once empty recipe binder now overflowing. Not only had she included my favorite meals from her kitchen, but she also polled the rest of the chefs in my family (and my husband’s! ), so that no delectable dish was forgotten. Like many other American families, mine is a blend of a variety of cultures, and the recipes in this binder reflect that. In my family, we show love and affection through food. Via this blog, I intend to deliver a plethora of culinary kisses from me to you. Follow along, as I work my way through the recipes from the family collection within the binder and beyond. As my inaugural post, and to serve as a warm welcome to The Cuban Reuben, my offering today is my namesake sandwich. This bocadito combines two of my favorites: the brine-y bite of a deli classic, corned beef reuben, and the nostalgic burst of flavor that is the Cuban. This toasty hero takes the term “double-decker” to a whole new level. To assemble this dish, you’ll need a flat sandwich press. Should you have trouble finding such a thing, go ahead and use your panini maker, foreman grill, or grill pan, but please don’t tell any Cubans I told you so. In the world of Cuban cuisine, using anything other than a flat sandwich press is sacrilegious, but I think I’m already doomed, since I added the ultimate in treif (roasted pork) to a Jewish classic. 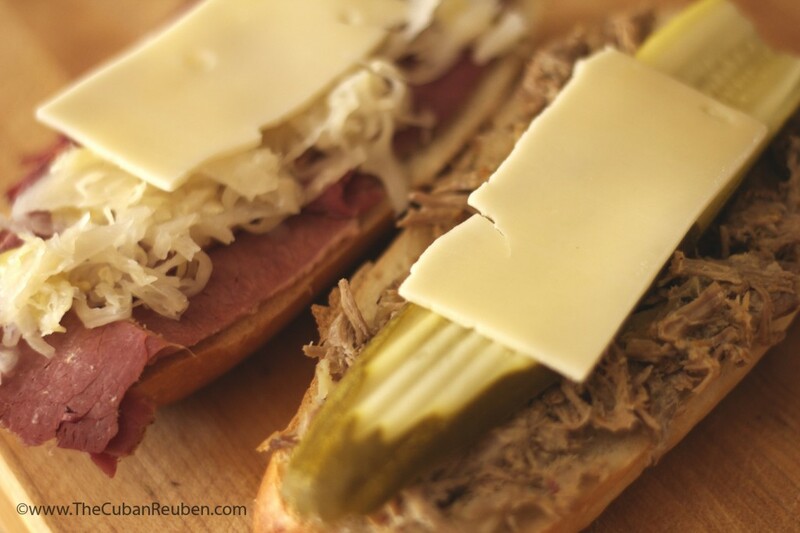 Once assembled and placed into the press, the Cuban Reuben is ready when the cheese oozes from the sides, the meat is warmed through, and the bread is crisp. Cut diagonally, and serve immediately. 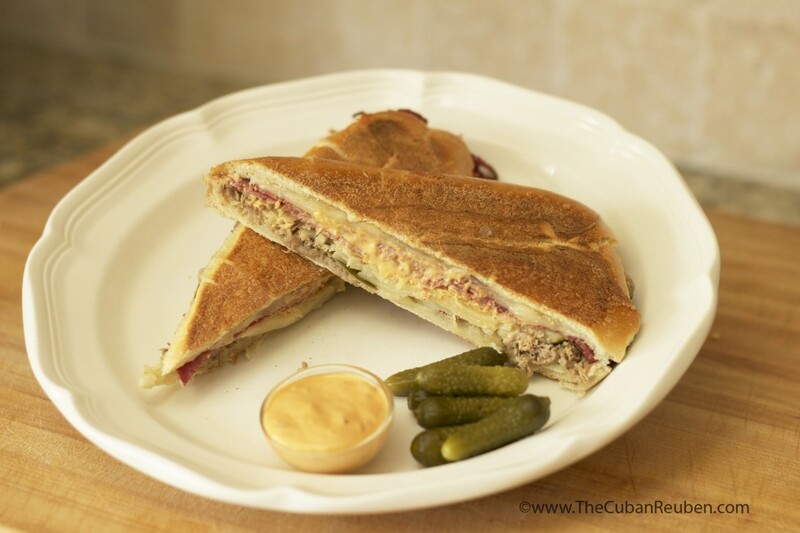 From my family’s loving kitchen to yours, I welcome you to The Cuban Reuben. Slice bread in half, and lay two pieces side-by-side. On one half, layer a slice of Swiss cheese, lean corned beef, sour kraut, and top with ½ slice of Swiss cheese. On the other half, layer a slice of Swiss cheese, roasted pork, dill pickle slice, and top with ½ slice of Swiss cheese. Add dressing or mustard, and close the sandwich. Press down on the top of the sandwich, flattening it a little. 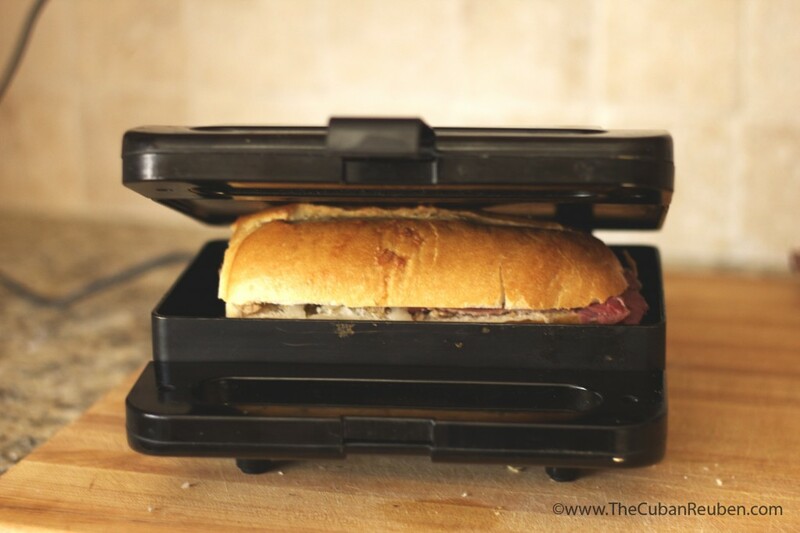 Place the sandwich in the press, and close the lid tightly. The sandwich is done when the cheese has melted, the meats have warmed, and the bread is crisp. Cut on the diagonal, and serve.